VAC BMW Race Seat Installation Kits are by far the easiest, most popular and best way to mount race seats into your 3 series or M3, period. Our acclaimed Race Seat Installation Kit is a nearly 100% universal application that will work with almost any side-mount install sport or racing seat, and allow a properly centered and comfortable driving position. These have been used to install all popular brands including: Sparco, Cobra, Status, MOMO, Bride, Recaro, Sabelt, Kirkey ect. 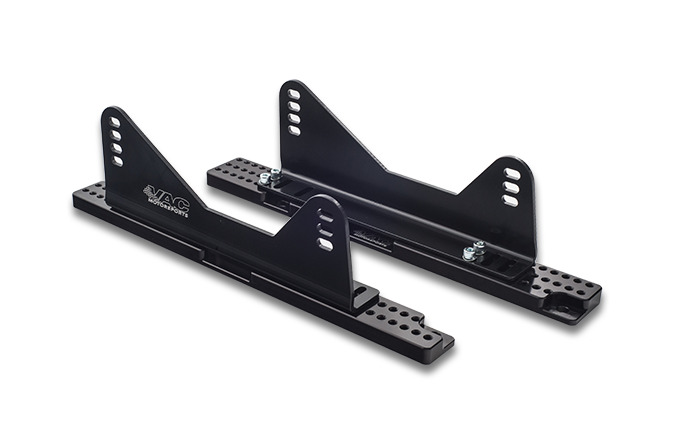 some Racetechs may require slight modification to the side mounts but the majority do not. The bottom line: this kit will work with nearly any side mount seat available. The ability to fit your seat of choice without being offset from the steering wheel like the seat companies side mounts. Seats that would normally be impossible to fit without heavy modification fit fast and easily. Wider slots in our Side-mount mounting flange to accommodate differing seat widths and seating preferences. Narrow Profile Design Side-mounts to allow seats to be moved to your liking and closer to tunnel for better fit and weight distribution. Lightweight yet extremely rigid aluminum construction Vs stamped steel. Aluminum will not rust or corrode, even if the powder coat is removed. Perfectly Compliment our World-Class VAC Floor Mount Adapters. For our E36 / E46 drivers who want to install racing harnesses, we can recommend our lap belt installation kit. These will take advantage of our Floor Mount Adapters and allow a place for securely fastening the lap belts without drilling holes. Racetech's RT-1000 seat should use the specific RT1000 side mounts from Racetech, please just purchase our FMA kit without side mounts. From Steven Eaton of Bracebridge, Ontario on 1/14/2018 . From Scott MacRae of Mercer Island, Washington on 8/13/2015 . From Phil M. of Zurich, Switzerland on 4/28/2014 . Brilliant in simplicity and flexibility! From Jesse Meagher of Bellefonte, Pennsylvania on 5/28/2013 . From Rob S. of Ridgefield, Connecticut on 3/28/2013 . VAC Fire Extinguisher Mount (BMW E36/E46) – Need to mount an extinguisher?